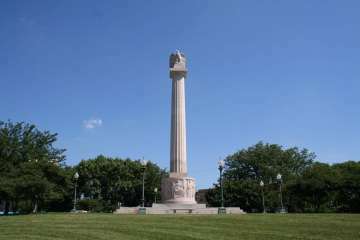 The Logan Square community area, one of the 77 Chicago designated communities, is centered on the public square that serves it’s namesake located at Milwaukee Ave, Logan Blvd and Kedzie Blvd. The square is named after General John A. Logan, an American soldier and political leader. In the middle of the square one can find the Illinois Centennial Column which was built in 1918 to commemorate the 100th anniversary of Illinois’ statehood. Located off the Blue Line running to O’Hare, this area is characterized by the prominent historical boulevards, grey stones and large bungalows. This neighborhood is bound by the North Branch of the Chicago River, Diversey Parkway, Bloomingdale Avenue and Metra/Milwaukee North Line railroad to the west. It has a diverse selection of dining options and a vibrant nightlife making Logan Square one of Chicago’s trendiest neighborhoods.